Balgownie Junior Football Club fields teams (mixed, boys’ and girls’) from U6 until U18. Last year over 600 players were registered with us. The U6 to U11 are called MiniRoos (previously SSG) and the U12 to U18 and Women’s Youth League are classified as “graded” teams. A fun and engaging introduction to football for boys and girls aged 5-11. MiniRoos is a smaller version of football that provides boys and girls aged 5-11 with a fun introduction to the world game. 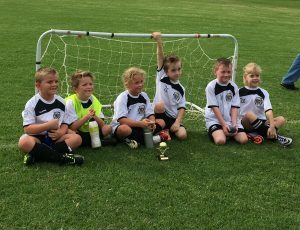 Delivered by grassroots clubs across Australia, MiniRoos provides opportunities for boys and girls of all abilities, shapes and sizes to play football. Games are played on smaller fields, with a reduced number of players to ensure everyone gets plenty of football action. As children grow, field sizes and teams expand too. Games are non-competitive, with no wins or losses recorded. For a full run down on Miniroos rules and formats you can download the guide here: MiniRoos Playing Guide. Parents of U6 & U7 players should read the BJFC U6 & U7 Guide Book to assist in ensuring your child has an enjoyable season. To register, a player must be turning 5, and not older than 18, any time during the playing season. Go to the Registration page to read more details about the process. In order for a player to play up a grade, see the Out of Age Policy page. From the age of 12, players are placed into teams that are graded based on ability, and grouped within appropriate competition divisions. Players compete within the Football South Coast district. See Grading Policy to read more on the guidelines used by the Club to sort team lists. Girls may played within Mixed or Girls teams between U12 – U15, and within girls only leagues from U16 up. Coaches and Managers are all volunteers but must be approved by the Club Committee. For more information on becoming a Coach or Manager, go to the Coaches & Managers page. All coaches are encouraged to compete FFA coaching courses, and are supported by the BJFC Technical Committee.